Parents and kids stream into Moscone Elementary’s airy courtyard before the sun does. At 7:50 a.m., it’s one of the earliest schools to start the day. But teachers beam, and principal Susan Wiggen is as enthusiastic as a teenager looking forward to the weekend. Moscone’s students have performed exceptionally well once again on last year’s standardized tests, with their scores for California’s Academic Performance Index (API) jumping to 855, easily surpassing the statewide performance target of 800. 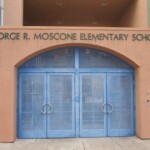 Moscone is the only school in the district to do so, and Wiggen wants the students to know. Wiggen — the world’s peppiest drill sergeant — leads morning announcements in the courtyard with call and response, as lines for each grade form out of the bunched chaos. “You all continue to shine!” she exclaims, arms flapping excitedly. Her young audience is undivided in its attention and quiet, despite a few ripples of excitement, but the parents continue to catch up with one another around the edges, and need to be shushed twice by the smiling principal. With 93 percent of the student body either Asian or Latino, and a vast majority learning English as their second language, morning announcements will now be translated, Wiggen proclaims. Relatively subdued versions follow in Spanish and Chinese by designated teachers, one using a bullhorn. The parents have finally hushed, and many now listen intently to the translations. She then leads everyone in the Moscone pledge: “I will work to be the best that I can for myself, my family and my community.” A chorus of small voices repeats the pledge in Spanish and Cantonese in unison with similar gusto. 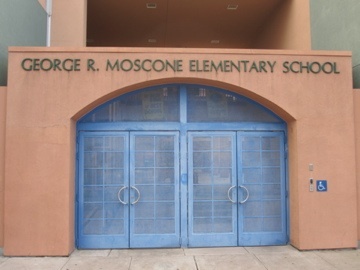 Parents and staff tend to mention “the Moscone way,” and try to pinpoint what sets the school apart. For instance, there are no playground structures (except a small one for the kindergartners), only balls to play with in the spacious schoolyard. “It does feel very communal,” chimes in Sean Ellsworth, a student teacher on his first day at the school. With a closing rallying cry of “Focus!,” the students march rambunctiously off to their classrooms. “She makes it fun,” says Ennies, who joined the daily morning gathering to watch. In most classrooms, children gather at the front of the room, seated in a bunch or circle, listening intently to their new teacher. Some parents remain, lingering in doorways to watch their children’s first day back. “That vision was established by the previous principal very explicitly and has continued with the new one,” Estonina says. As a teacher on special assignment, Estonina certainly has perspective, having spent time at many schools throughout the city as well as a few in Oakland. Her office door remains open to the courtyard. Students stream through as a class or individually to get a boost from their adored principal. Her enthusiasm pervades the whole school and the discipline of the children feels natural and effortlessly maintained. This is not convincing. Any number of schools go through the early morning rituals and what elementary school would say they don’t focus on reading, or maintain low expectations? If something really is different at Moscone in terms of curriculum or classroom management then let’s hear about it. Cheerleading is not reporting. i already apologize. i would like to hear from norma govea. i do not know if i could hear from her now, but would love to do so. we kinda grew up on bryant st. actually, i did when i was a kid. so if you see this norma my cell number is (707) 330-9094. I would love you to call me.